I managed to make a card for Freshly Made Sketches. I've been able to stamp a bit while mom is here so I thought I'd join back in. Of cousre I didn't get it posted on time... The sketch this week comes from Jen B and it worked perfectly with a flower I'd colored earlier in the week. The rest of the team made some beautiful cards, so be sure to stop by the blog and check them out. Labels: Christmas, Freshly Made Sketches, Joyful Christmas, Stampin' Up! Your flower is gorgeous! Beautiful holiday card! This flower is amazing! Beautiful work!! Oh wow Rita! That poinsettia is so gorgeous! The colours are so vibrant! Love the red and green! Perfect for Christmas! So glad you were able to get some stamping in this week! Beautiful flower and it really pops against the green stripe and the white background. I'm glad you're getting some "me" time. 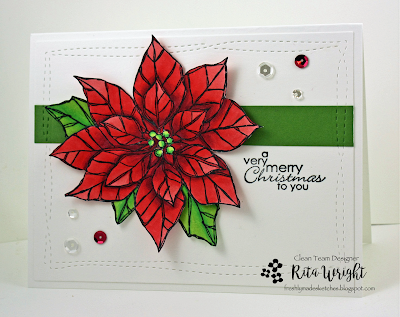 I'm so glad you are getting time to create and what a stunning poinsettia you created. I love it on white with the simple green strip and splash of sequins! That is a beautiful card!! Hope you are doing ok and will be able to join us again. Best wishes.